Do you daydream about a future where you’re the one in the cockpit, flying across the world? Maybe you have a knack for engines and love figuring out how they work. Or just maybe you get a thrill at the idea of moving planes and people through the sky. If any of these spark your curiosity, California Aeronautical University might be right for you. 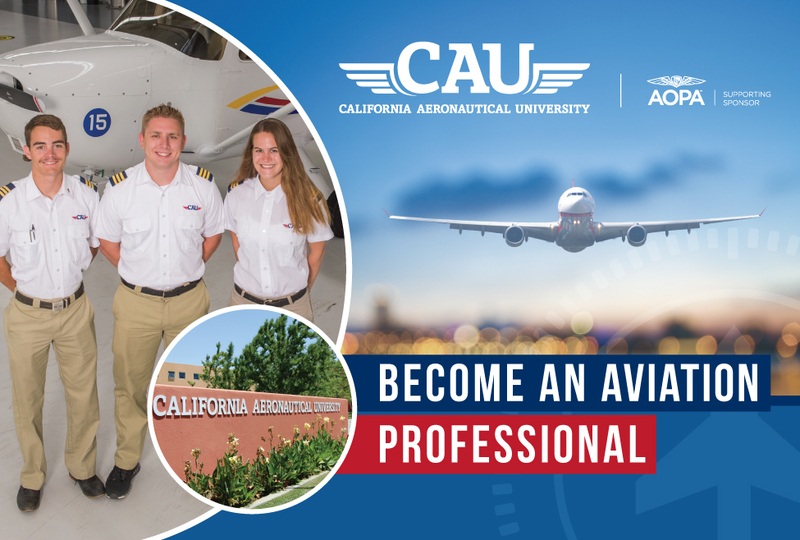 California Aeronautical University offers aviation-related degree programs and training for students seeking careers as professional pilots, mechanics, and aviation business professionals. With the looming pilot shortage, the University’s flight programs are especially popular. For new students in flight programs at California Aeronautical University, it’s pretty clear from the start that they’re in for an exciting journey. Starting the first term of school, students begin flying the blue skies of Southern California with seasoned flight instructors aboard California Aeronautical University aircraft. Back on the ground, ground instructors begin introducing them to realistic flight training on advanced flight simulators as well as practical demonstrations and dynamic lectures. Students in the professional pilot degree programs gain enough ground and flight instruction to earn six different aviation certificates/ratings upon graduation. The variety of certifications and ratings (private pilot, instrument rated pilot, certified flight instructor, certified flight instructor instrument and commercial pilot-single and multi-engine) gives graduates a range of employment options to choose from. With CAU being FAA Part 141 approved, graduates of the University’s Bachelor of Science in Aeronautics professional pilot program also receive a 500-hour reduction in their FAA- mandated Airline Transport Pilot (ATP) flight hour requirement (normally 1500 hours). Strong and growing relationships between the University and important airline partners are critical to the success of CAU graduates entering the field. California Aeronautical University has partnered with several regional airlines, including SkyWest Airlines and Piedmont Airlines, to create opportunities for their graduates upon completion of their professional pilot degree program. The California Aeronautical University campus is located on the Bakersfield International Airport at Meadows Field in beautiful Southern California. Designed for comfort so students feel at home but equipped with the tools and technology for stimulating training, CAU’s exceptional facilities combine the best of both worlds. A 32,000-square-foot hangar for students training in CAU’s aircraft maintenance program. Comfortable, on-site student housing with 168 rooms – each with a private bathroom and study area – lounge areas, meeting rooms, and laundry facilities. Aside from pilots, the aviation industry also needs properly trained aviation professionals to manage airports, airlines, fixed base operators, flight schools and aircraft manufacturing facilities. CAU offers business degree programs that prepare students for careers in these administrative positions, including a bachelor’s degree in aviation business administration and an online MBA. The University also offers program in aviation dispatch, aircraft maintenance and a master’s degree in aviation science. Whatever area you’re interested in, CAU can help you become an aviation professional. To better serve Southern California residents, CAU launched Flight Centers in Ventura (KOXR) and San Diego (KMYF) Counties. The University Flight Centers provide local residents the opportunity to pursue their Bachelor of Science in Aeronautics degree online while receiving flight instruction from their local Flight Center. California Aeronautical University offers financial aid to those who qualify and accepts veteran benefits. CAU also offers several scholarships, including the “Dreams Take Flight Scholarship,” an award up to $150,000. Contact the University for more information. The University has several enrollment periods throughout the year. Prospective students interested in scheduling a campus tour or getting more information can visit the University website at www.calaero.edu or call (661) 615-5915.